Gardens in coastal areas can be problematic. The climate presents many challenges – strong winds, frequent storms, sea spray, and sandy soil are bad news for gardeners. Leaving property owners with patchy, lack-lustre lawns, and parched, withered plants. The biggest problem with coastal landscaping is the wind. Ferocious winds carry salt and sand which desiccate grass lawns, plants and trees. Experts recommend using a wind break, a hedgerow or fence to shelter your garden from the high winds. This may save a few plants but isn’t ideal when it comes to lawn care, because grass doesn’t fare well in the shade. The second issue with seaside gardens is soil quality. The soil can be salty, sandy and lacking in nutrients. It is often light and fine and therefore is blown away in high winds. This exposes the roots of grass and plants which are dried out by the sun. You’re left with a parched and patchy lawn and shrivelled shallow-rooted plants. It’s a nightmare for those that own holiday homes by the sea, because you’re not there to give your garden the extra attention it needs. If you’re property is on the sea-front storms can cause salt water to wash over your garden, and winds will batter your plants with beach sand. 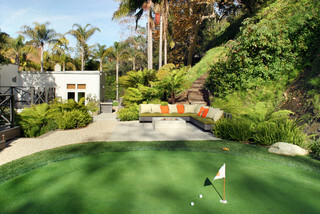 Fake grass is the ideal solution to give you a lush green lawn by the sea. Unaffected by the coastal climate, it will give you a beautiful garden with none of the hassle. If you have an apartment, you can even use it to cover balconies or terraces, any salt residue will simply wash off. Can a fake grass garden help hay fever symptoms? Hay fever is a pollen allergy. The reaction irritates the nose, eyes, throat and sinuses. Symptoms vary in severity, from sneezing and itchy eyes to facial pain and shortness of breath. As many as 1 in 5 people will suffer from it at some point in their lives. There are around 30 different types of pollen you can be allergic to. The most common varieties are grass, weed, and tree pollen. In the UK, 90% of hay fever sufferers are allergic to pollen from grass. This is released into the air between the months of May and August, turning summer into a long, miserable season of cold-flu type discomfort. Can a fake grass garden can reduce hay fever? Well…first, it’s important to note there are no empirical studies to suggest those with an artificial garden are less afflicted. However, it stands to reason that if there’s less pollen surrounding your home, and less getting into the house, you should feel a little better. Firstly, cutting the grass is the worst thing you can do to stir up pollen. When it’s released into the air, it sticks to people and clothing, which then ends up coming into the house. With an artificial lawn, this won’t happen as you’ll never need to mow. If you have children with hay fever, you may have a strict ban on outdoor play in the summer, as it exasperates their symptoms. With fake grass, you might find they’re OK to play without feeling the effects. The NHS advises you to keep pets outside to stop them bringing pollen into the house, and not to dry washing outside as it gets on your clothes. While you can never prevent pollen 100%, at least if your dog has been rolling round on the grass, he won’t be covered in the stuff. Posted in Artificial Lawn Advantages, Fake Grass | Comments Off on Can a fake grass garden help hay fever symptoms? Design Blitz have turned an old warehouse in the heart of Silicon Valley, California, into a world-class HQ for Skype. The company used fake grass in this incredible project to encourage collaboration and creativity. The 54,000sqft Palo Alto offices support 250 employees. The challenge was to differentiate Skype from other tech giants operating in the Bay area, ultimately, to aid in the recruitment of the best talent. Skype believe in the power of the environment to influence thought processes. The company actively encourages ‘accidental meetings’ for the generation of ideas. Fake grass is used to create picnic spot style ‘islands’ for spontaneous collaboration. Giant pebbles, a block of wood and bright chairs are used for low-level, relaxed seating. The board room is a pod, clad in flavour sticks. These sticks are added to wine barrels to instil oak flavouring, and were salvaged from local wineries. The staff games room has a large fake grass covered wall, pool and footballs tables, and two comfortable seating areas. Six red, retro telephones are mounted in a row, running along the centre of the grass wall. These are actually safety phones that already existed in the building, cleverly reused as artwork. Skype is making the landline obsolete, so this makes an interesting and apt design feature. The project demonstrates how fake grass can be used creatively in office interior designs. It can be used as a floor or wall covering to create contemporary spaces that encourage creatively in a relaxed environment. 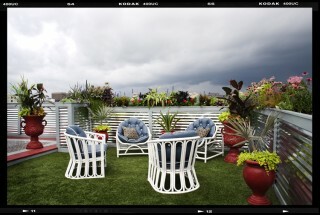 The London Borough of Bromley are using fake grass to create a vibrant, summer setting to stage events. 800 sqft of artificial grass has been installed outside the Churchill Theatre, on Bromley High Street, along with benches and beanbag seating for shoppers to enjoy the entertainment. The town will host a series of free events from now until September, making Bromley the place to be. These include martial arts demonstrations, craft sessions, story-telling, face painting, dance shows, music, and mini golf. Visitors are invited to come down and see what’s happening, relax in the gardens and enjoy the sunshine. The High Street Garden is supported by the Mayor of London’s Outer London Fund. Mayor Johnson has pledged £2m to enhance public spaces across Bromley. If you’re hosting a summer event, fake grass can provide the perfect setting. It allows you to create a comfortable, attractive space for guests to enjoy – just like Bromley Council have achieved. With a few decorative accessories, you can even build an entire theme around your new lawn such as elegant garden party, or tropical oasis. It’s practical too. You can install the carpet on any flat surface so it’s ideal to cover up dull, concrete areas. It’s quick and easy to set-up. The best thing is, you can clean it thoroughly afterwards with a hose and reuse at future events.